HDD Spotlight Bargain: 'Supernatural: The Complete First Season' Blu-ray $15 at Amazon Canada! Join Sam and Dean Winchester on their early monster-hunting adventures in high-definition for an amazing price! 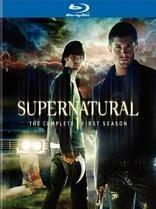 The online retailer is selling 'Supernatural: The Complete First Season' for $15 (76% off suggested list price). For fans this is a no-brainer, but if you've never seen this hit series now is the perfect time to order a copy of the premiere year!